Jeffrey Sica joined ARC-TS in May 2016 as a research database administrator. 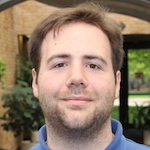 Jeffrey is a self-taught programmer and previously worked at U-M for 11 years in the Pathology department, where he was a business systems analyst lead architecting and overseeing the department’s web services. In his free time, Jeffrey also enjoys computer programming as a hobby, along with reading, exercising, golfing, and fishing.